Product Details- Use- surrounds odor molecules, stopping them from causing odor, Designed for removing foul odors on pets, furniture, or pet bedding Suitable- All Breeds Dogs and Cats. 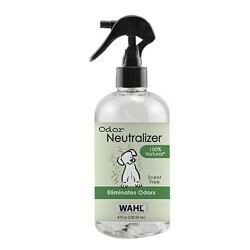 Product Information- The Wahl Odor Neutralizer uses encapsulating technology that surrounds odor molecules, stopping them from causing odor. It is scent free for sensitive dogs and cats. The spray is safe for people and pets. Designed for removing foul odors on pets, furniture, or pet bedding .